After a pre-season which gave no clues of what was to come, Jacques Santini's side opened with 4 unbeaten games, scoring just one in each, but winning at Newcastle with a sensational Thimothee Atouba goal. Jermain Defoe scored the other three, and already, Spurs were proving a tough nut to crack defensively, with the class of Naybet beside Ledley King. Sean Davis won the Spurs Odyssey accolades for Player of the Month, and the team was 3rd in the Premiership. It's the end of the month, before we lose our first game of the season, at home to Manchester United. Until that 1-0 defeat we had kept a clean sheet throughout the month, and four in successive games. Norwich took a point away from The Lane and Jose Mourinho made his famous "Team Bus" comment after a our great defensive display at Stamford Bridge in a second 0-0 of the month. In our first Carling Cup venture in the North-West (to be a happy hunting ground for us before Christmas), Santini actually started the game with eleven who had been at White Hart Lane before his arrival, and that of the incredibly busy Frank Arnesen. (Now to be consigned to the Spurs scrap heap of traitors) Things seemed to happen once Pedro Mendes came on after the hour, and a 1-0 lead was turned into a 6-0 rout, with even fringe player, Goran Bunjevcevic getting on the score sheet. Ledley King got my Player of the Month vote. At this time, Martin Jol was pretty much a mystery man, deep in the background in the Managerial set-up. After such a promising start to the season, and a win at Goodison Park in the first fixture this month, Spurs started their depressing six-match run of Premiership defeats, losing at Portsmouth, at home to Bolton and at Fulham in Jacques Santini's last game before his mysterious disappearance into the sunset. That Fulham game was one of the worst performances of the entire season, and a League Cup extra-time thrilling revenge win at The Reebock Stadium did little to assuage the worries about League form. The over-riding memory from this month though was the devastating news on October 23rd of the passing of Spurs Legend, Bill Nicholson. Bolton's visiting fans joined in the emotional and impeccable silence at White Hart Lane. 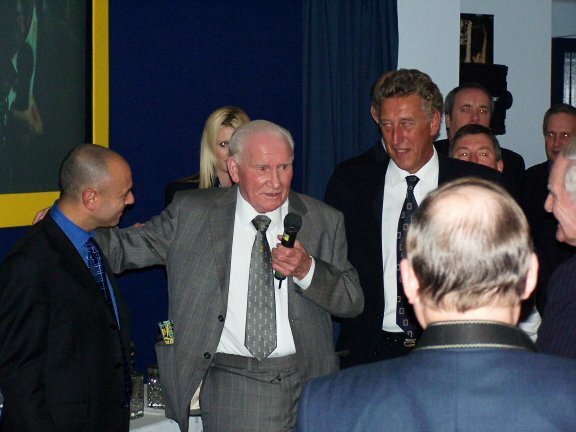 On the Sunday after a private family funeral for Bill Nicholson, a beautiful memorial service was held at The Lane, during which ex-players paid glorious tribute, in what I described as "The Greatest Team Talk Ever". It took a while to take full effect, as we had to wait till the end of the month for Martin Jol's first Premiership win, at home to Middlesbrough. Our League Cup run and winning habit in the North-West continued with a 3-0 win at Turf Moor which included a spectacular dipping 25 yarder from Jermain Defoe. Defoe also scored a great solo goal at home to Arsenal, but an amazing 4-5 defeat bore little solace to home fans. Unsurprisingly, the "Spursometer" grade for defence fell below the 50% mark for the first time in the season, conceding 9 goals in 5 games. We slipped to our lowest position of the season during this month (14th). It's time to pay tribute to Martin Jol, who brought a breath of fresh air to Tottenham, with his open enthusiasm for the club and its fans, and improved upon the Santini style of football. "Big Marty" was to be awarded the Premiership Manager of the Month award for technically remaining unbeaten throughout. "Technically" because the major low of the month was to be knocked out on penalties to a mixture of Liverpool's Reserves and even Youth players that we had been expected to cast aside with ease. There ended the easiest route to Cardiff for Spurs, who did thrash Southampton, and beat Blackburn and Man City away. Fredi Kanoute, who had conceded the penalty that led to Liverpool's equaliser, then missed his penalty in the shoot-out, redeemed himself with a magnificent winner at The City of Manchester Stadium, whilst Michael Brown stormed away on a fantastic run to tee up Robbie Keane at Ewood Park. I think we missed the Brown energy and determination in our closing games of the season. The month ended on a low, when we could only draw at home to Palace. Dean Marney stole the headlines with a stunning brace on New Year's Day, as we sent Everton back to Goodison with their tails firmly between their legs. There's no need to say more about January 4th at Old Trafford, but Spurs were generally struck by the curse of the Manager of the Month award, as they struggled (but succeeded) to make progress in the FA Cup, lost at home to Chelsea, and embarrassingly were beaten 3-0 at Selhurst Park. On the bright side, more new names arrived, such as Mido, El Hamdaoui, Radek Cerny, Andy Reid and Michael Dawson. El Hamdaoui was the only one of these not to get a first-team chance, but having seen him in the Reserves he is quite a prospect, I think, with skillful touches, and speed to match. February started with defeat at Bolton, who achieved their fifth consecutive League win against us, but then Mido made a great debut against Portsmouth, becoming the first to score two on his debut since Chris Waddle in the 80s. Sadly he has never really matched that start, and rumour has it the mangager was not happy with his "condition" as the season ended. We beat West Brom in a 4th Round replay, but then made hard work of beating Forest, who were eventually relegated to the third level of English football. Keane and Defoe dominated the scoring charts, as they did all season, getting scant support from the rest of the team, and chiefly the midfield. Although we were consistently in the top half in the second half of the season, March goes down as another disappointment. After putting Forest to rights at The City Ground, we were beaten at St James' Park despite a good show that deserved better. That 1-0 loss came in the middle of two other away defeats, at Southampton and Charlton, where the team failed to perform. We scraped a win at home to Man City in the last game of the month, but Thimothee Atouba was to be banned for three games after video-evidence convicted him of elbowing Joey Barton in the run-up (off the ball) to Robbie Keane's winner. I wrote this in my review of the month's performances:- "I think we were entitled to expect more in the way of points return from the matches we played, and we under-achieved against Birmingham and West Brom in the end. We have had the chance in the second half of the season to forge a path ahead in the qualification race, and my gut feeling remains that we will just miss out. It may be the same old message, but we must be satisfied with the progress Spurs have made this term." Memorable moments came from Michael Dawson's debut at Anfield, and his continued form in his other games, plus of course a thunderbolt from Erik Edman! Did we leap at that! We had a great start to the tenth footballing month of the season, with that 5-1 win over Villa, in which Simon Davies (now departed to Everton) gave a scintillating performance. He didn't score though, and he had not scored for us all season. Spurs failed to score in their last two games, as they threw away the real chance they had forged of a UEFA Cup entry. Martin Jol has since admitted that he told the team to "be nice" in the Blackburn game, in the hope of improving our chances of being drawn out of the "Fair Play Award" hat. Sadly our failure to emerge successfully from that draw on June 5th capped a rather disastrous week-end for Spurs as the Arnesen story emerged of his desire to work for Chelsea, whose approach was decsribed as illegal by THFC. Despite the lack of a major football tournament this summer, the close season is going to be rather busy! � See the Spursometer for Season 2004-5 here!